Colleen Cambron, Scranton, and Gary Kinney, Scranton, were the first $50 instant winners in the Christmas on Us contest. 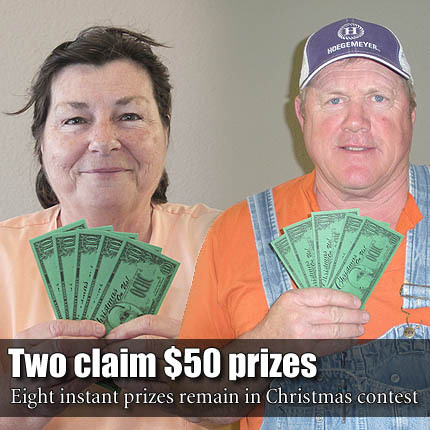 OSAGE CITY—Two winners in the Christmas on Us promotion stepped forward to claim $50 in scrip money, but eight $50 instant prizes remain to be won, before the final drawings Dec. 19 at Osage City High School auditorium. Gary Kinney, Scranton, was the first winner in this year’s contest, turning in a winning ticket from Trembly Chiropractic for a $50 prize. The corresponding number was hidden within last week’s Feltner Floors and Furniture ad. He plans to use the winnings to fill up his tank at Casey’s General Store in Overbrook. Colleen Cambron, Scrnaton, won her $50 with a ticket she purchased at Casey’s General Store, in Scranton. The winning number was located in the Gibson TruCare Pharmacy ad. She plans to spend her prize at Casey’s or Jerry’s Thriftway. Three prizes went unclaimed last week, including a ticket number from Furniture Loft, hidden in the Swisher Automotive ad; a ticket from Artfully Quilted by Barbs hidden in the Casey’s Burlingame ad; and a ticket from Casey’s Overbrook, hidden in the Osage Hardward ad. Eight $50 instant prizes remain up for grabs as of the third week of The Herald-Chronicle’s Christmas on Us promotion. There are six numbers are hidden in week’s ads. The countdown is under way for the grand prize drawing for two $1,000 prizes, and two $250 prizes, to begin at 6:30 p.m. Wednesday, Dec. 19, at Osage City High School auditorium. Entertainment and door prizes will be available. You must be present at the grand prize drawing to win, and the scrip money is only good at participating merchants. It is simple to win but tough to decide where to spend the winnings with the 30 merchants participating in the county-wide contest.